Since most public lands in New York are open to hunting, as well as other forms of outdoor recreation, outdoor enthusiasts of all kinds will be sharing these lands with hunters. 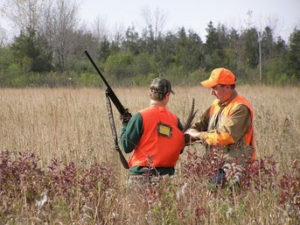 Hunters in New York have an outstanding safety record thanks to mandatory hunter education training delivered by a large group of dedicated volunteer instructors. In addition, wearing blaze orange or pink or another bright color also makes it easier to be found by a Forest Ranger, Environmental Conservation Police Officer, or other rescue personnel if visitors become lost, sick, or injured while afield. Pet owners are encouraged to dress dogs, as well. Dogs should wear blaze orange or pink or another bright color too, and stay leashed at all times. Trapping seasons for many species including fox and coyote are open throughout the fall and early winter; traps set for these species can also capture dogs that are not under control. Trapping is a highly regulated activity and regulations are strongly enforced. Trappers are required to take an educational course before getting a license and DEC works closely with the trapping community to encourage trapping techniques that minimize risks to non-target wildlife and other animals like dogs. Keeping dogs on a leash is safer for the dog, for other people, and gives pet owners peace of mind. Hunting is among the most popular forms of wildlife recreation in the state, drawing nearly 700,000 New Yorkers and more than 50,000 out-of-staters. Hunting is a safe and economically important outdoor pursuit, helping to balance wildlife populations, promote family traditions, while fostering an understanding and respect for the environment and the complexity in which it functions. Hikers should be aware that they may meet hunters bearing firearms or archery equipment while hiking on trails. Hikers are encouraged to recognize that these are fellow outdoor recreationists with the legal right to participate in these activities on Forest Preserve and Conservation Easement lands. Hunting accidents involving non-hunters are extremely rare. New York state lands offer many places to hunt, including 81 parks, three historic sites, three golf courses, and 50 boat launches that provide chances to hunt a variety of different wildlife including big game, small game, turkey, furbearers, waterfowl and migratory bird species. Learn more about Statewide Hunting Regulations in NY State Parks and the Policy on Possession of an Unloaded Firearm for the Purpose of Accessing Adjacent Lands for Lawful Hunting Purposes. In addition to a valid hunting license, all hunters wishing to take advantage of select hunting seasons within State Parks need to obtain a regional hunting permit for each individual park. The hunting permit will specify which species can be hunted, any additional seasonal restrictions, areas available for hunting, and what implements (e.g. shotgun, bow, or crossbow) can be used. Please contact the park directly to learn about what hunting opportunities are available at that location. For information on hunting safety, and hunting seasons, and trapping seasons, please visit DEC’s website.